As part of the Promote Sustainable Program of energy Consumption Through Energy Management System (PROSPECT-EnMS), the Asia Society for Social Improvement and Sustainable Transformation (ASSIST) and its project partners held three SME Leader’s Forums in Hanoi, Da Nang and Ho Chi Minh City in Vietnam, from June 6 to June 8, 2012. PROSPECT-EnMS is a Public-Private Partnership project jointly implemented by DEG, TUV NORD Vietnam & ASSIST and is scheduled to run from March 2012 to August 2013. It ultimately reckons the challenge the rapidly growing Vietnamese economy faces now- balancing environmental sustainability with the urge of maintaining socio-economic growth. This balancing act can only be performed by successfully tackling the country’s mostly inefficient use of energy. ASSIST and its project partners aim at improving energy management among local SMEs through the implementation of EnMS and energy efficiency best practices, which will contribute to Green House Gas emission reduction and therefore put the country’s future development on an environmentally sustainable basis. The SME Leaders’ Forums gathered some 80 representatives of Vietnamese SMEs as well as from governmental bodies. The implementation parties were represented by TUV NORD Vietnam Project Director Le Sy Trung, ASSIST Mekong Regional Director Aru David, and ASSIST Lead Consultant G. Krishnakumar. Besides introducing the project, the management team provided an overview of ISO 50001 and the selection criteria for 10 pilot SMEs, which will serve as showcase for the successful implementation of Energy Management Systems. The events were graced by the presence of Nguyen Kinh Luan, from the Ministry of Industry and Trade (VNEEP), Vu Thi Bich Hau, the Vice Director from the Department of Science of Technology in Da Nang and representatives of ENERTEAM. They gave the attendees a broad insight into their comprehensive experiences with regard to current issues of energy consumption in Vietnam and the question of how to manage energy systems efficiently. 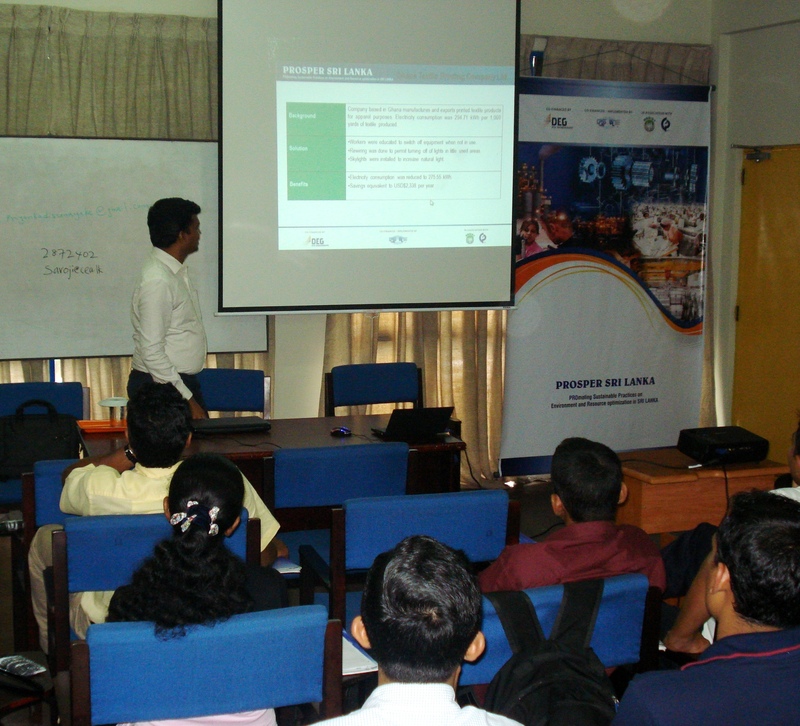 In collaboration with its partners for the PROmoting Sustainable Practices on Environment and Resource optimization (PROSPER) in Sri Lanka project, Asia Society for Social Improvement and Sustainable Transformation (ASSIST) led the training of trainer workshop at the Plastic and Rubber Institute, Rajagiriya, Sri Lanka last May 23 to 25, 2012. PROSPER Sri Lanka is a project co-financed by DEG and UL DQS and implemented by UL DQS, ASSIST, and NCPC, Sri Lanka that will run for 18 months. The project aims to raise overall awareness on the need and means to implement Resource Efficient and Clean Production (RECP) methodologies and strategize transfer of knowledge through a series of trainings and capacity building initiatives. The skill building training courses will target SMEs from manufacturing, textile and apparel, and food and agro-processing sectors. The project will also help 10 companies with direct assistance for implementation of RECP. Thirty (30) participants from the chemical, textile, and service industries, participated at the three-day training, which was also graced by US Agency for International Development (USAID) Project Management Specialist Priyanka Dissanayake and Sri Lanka Central Environment Authority Deputy Director Sarojini Jayasekera. Project implementers were represented by ASSIST Projects and Grants Management Director Sathappan Sathappan and the Sri Lanka National Cleaner Production (NCPC) team led by Director Mr. Sena Peiris and Deputy Director Mr. Samantha Kumarasena. Featuring lectures, group activities and interactive discussions, the workshop introduced the project and the concept of RECP among the key stakeholders from various industries. Select companies from this pool will be chosen for the pilot implementation of RECP in their organizations. 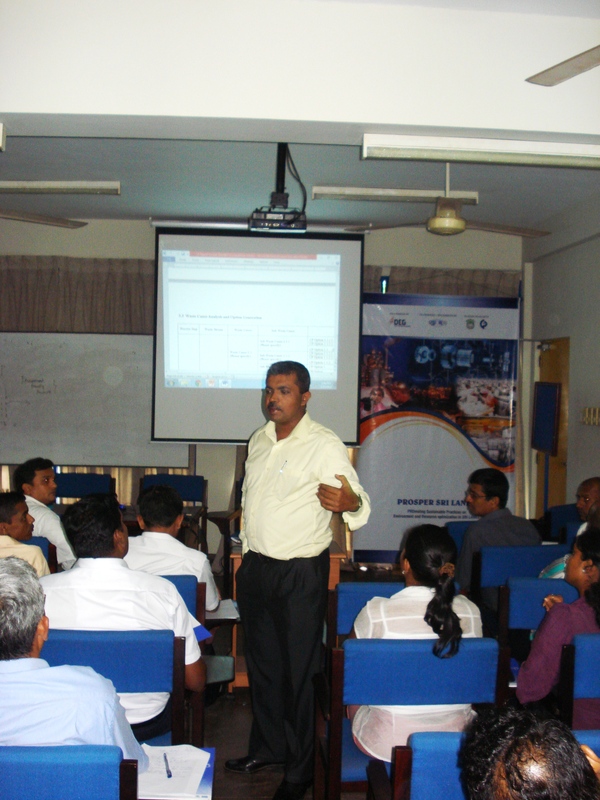 Thematic sessions on Water, Energy, and Chemicals were conducted by Dissanayake, Cleaner Production consultant Nimal Perera and Jayasekera, respectively. At the end of the workshop, an open forum was conducted to solicit inputs from the representatives on the strengths and opportunities of harmonizing initiatives towards achieving RECP.